Aim To compare the long-term outcome of photodynamic therapy (PDT) with that of intravitreal bevacizumab (IVB) for myopic choroidal neovascularisations (mCNVs). Methods 24 eyes were selected from 40 consecutive patients with mCNV, and the patients were divided into Group A, consisting of 12 eyes treated by PDT, and Group B, consisting of 12 eyes treated by 1.25 mg IVB. The age and best-corrected visual acuity (BCVA) were matched between the two groups. The BCVA, size of the chorioretinal atrophy surrounding the CNV (CRA), central foveal thickness (CFT) and CNV thickness were determined before and at 12 and 24 months after the treatment. Results The BCVA did not change after PDT but was significantly improved from 0.75±0.25 to 0.49±0.42 logMAR units at 12 months and to 0.50±0.38 logMAR units at 24 months after IVB. The CFT were significantly reduced in both groups at 12 and 24 months. The CRAs were larger in group A than in group B at 12 and 24 months, and their sizes were correlated with the BCVA. Conclusion At 24 months, IVB is more effective than PDT in treating mCNV. The enlargement of the CRA might be related to the incomplete visual recovery after PDT. A sub-Tenon or intravitreal8 injection of triamcinolone acetonide has also been reported, but the results have not been completely satisfactory. Thus, the purpose of this study was to compare the effectiveness of PDT or IVB for treating mCNVs for up to 24 months. We also examined whether either of these treatments will result in a greater postoperative chorioretinal atrophy (CRA) surrounding the mCNV, and the relationship between CRA formation and visual function after treatment. The medical charts of 40 myopic eyes of 40 patients were reviewed (16 treated by PDT, 24 by IVB). The inclusion criteria were: refractive error >−6.0 D, type 2 CNV showing fluorescein dye leakage, no treatments before our initial treatment for the mCNV, follow-up period longer than 2 years, juxtafoveal or subfoveal location of the mCNV, characteristic pathological myopia fundus and interval from initial onset of symptom to treatment <6 months. The patients were placed in Group A, which included 12 patients treated with PDT alone, and Group B, which included 12 patients treated with IVB alone. To minimise the disadvantages of a retrospective study and to increase the reliability of comparing two groups, we selected 12 pairs of patients. As reported by Hayashi et al,18 we matched patients based on age (within 5 years) and initial best-corrected visual acuity (BCVA, within 0.2 logMAR units). We excluded patients with an initial BCVA <0.1 and those younger than 40 years. The initial treatment was carried out from August 2004 to August 2006 in Group A and from September 2006 to the present in Group B. Because we switched the treatment from PDT to IVB in August 2006, none of the patients received PDT after that time, that is, none of the patients were treated with both treatments in the same eye. This study was approved by Institutional Review Board of Chiba University Graduate School of Medicine and was conducted to conform to the tenets of the Declaration of Helsinki. Patients were informed of the purpose of the treatments, experimental nature of the treatment and possible complications, and a written informed consent was obtained from all patients. All patients had a complete ophthalmic examination including; measurement of the BCVA, slit-lamp examination, indirect ophthalmoscopy, fluorescein angiography (FA) and indocyanine green (IA) angiography, and optical coherence tomography (OCT; Zeiss Humphrey Instrument, Dublin, California) at the initial examination or before the initial treatment. PDT was performed as reported in detail.9 Briefly, 6 mg/m2 of verteporphin (calculated from body surface area) diluted with 30 ml of 5% dextrose was injected intravenously at about 3 ml/min. Fifteen minutes after the start of injection, a diode laser (689 nm) was used to deliver 600 mW/cm2 over 83 s resulting in 50 J/cm2. The laser spot size was based on the greatest linear dimension (GLD) measured in the early-phase FA images. IVB was injected through the pars plana into the vitreous cavity under sterile conditions. The dose of bevacizumab (Avastin; Roche, Basel, Switzerland) was 1.25 mg in 0.05 ml of saline. The injection was done with a 28-gauge needle 4 mm from the limbus under topical anaesthesia. The patients were instructed to apply antibiotics eye-drops for seven postoperative days. PDT and IVB were repeated if the BCVA decreased by more than two lines of the BCVA at the last visit, or retinal oedema was detected by OCT indicating persistent CNV activity. Before each re-treatment by PDT or IVB, FA was done to confirm the location and activity of the CNV. The BCVA, the central foveal thickness (CFT) and the CNV thickness were recorded every month after the treatment for 6 months and every 3 months thereafter. FA and IA were done on all patients of both groups at 3 months to determine the necessity of repeated treatment. Although the first evaluation at 3 months by FA and IA after the IVB might be late considering the pharmacokinetics of IVB, we believed that it was better to be cautious and search for any adverse events because there was not enough evidence of its safety when we started using IVB. After the first evaluation at 3 months, angiography was done only when the sign of a recurrence of CNV was observed. An atrophic area around the CNV was considered to be a CRA, and the choroidal vessels could be seen through the atrophic RPE. The CRA was detected in the colour fundus photographs as reported.19 The size of the CRA was expressed as the ratio of the area of the well-demarcated CRA surrounding the CNV divided by the area of the optic disc measured by the program included with IMAGINET (Topcon, Tokyo, Japan). The statistical analyses for the changes of BCVA, CFT, CNV thickness, and CRA were performed after determining that the values were normally distributed. Paired (Student for equal distribution or Welch for unequal distribution) and unpaired t tests were carried out if the normal distribution was confirmed. Otherwise, a Mann–Whitney U test was done. The presence of specific findings was tested using the χ2 test. The significance of relationship between BCVA and CRA, CFT was tested by a Spearman correlation coefficient test. p Values <0.05 were considered to be statistically significant. The patients demographics are shown in table 1. The CNV was located juxtafoveally in four eyes in both groups, and the remaining eyes had a subfoveal CNV. The numbers of eyes with other myopic fundus changes20 were not significantly different between the two groups. The baseline mean BCVA was 0.77±0.25 (range 0.3–1.0) logMAR units in Group A and 0.75±0.25 (range 0.4–1.0) logMAR units in Group B (p>0.05; table 1). The pretreatment size of the CNV, GLD, CFT, CNV thicknesses and CRA area were not significantly different in the two groups. Three (25%) eyes in Group A and five (41.7%) eyes in Group B were treated more than once during the 24-month follow-up period. The mean number of treatments was 1.3 times in Group A and 1.6 times in Group B. These three eyes in Group A were given PDT twice, three of five eyes in Group B had IVB twice, and two eyes had IVB three times. All of the eyes retreated by PDT and four of the five eyes retreated with IVB had a re-treatment in the first year. Only one eye in Group B was retreated in the second year. Representative cases are presented in figure 1 (Group A: PDT) and figure 2 (Group B: IVB). Left eye of Japanese man treated by verteporfin photodynamic therapy. The refractive error was −11.5 D. Two months after the onset, the patient received photodynamic therapy. A one-disc-diameter subfoveal myopic choroidal neovascularisation (CNV) was observed accompanied by subretinal haemorrhage and a 0.72-disc-ratio chorioretinal atrophy (CRA; blue line). The best-corrected visual acuity (BCVA) was 0.3 (top left). Fluorescein angiography (FA) shows dye leakage in the late phase (middle left), and optical coherence tomography (white line indicates scan line in colour fundus image) shows a type 2 choroidal neovascularisation with retinal oedema (bottom left). Twelve months after the treatment, subretinal haemorrhage is not present, and the CRA has increased to 2.24 disc ratio. The BCVA remained at 0.3 (top middle). The hyperfluorescence of the tissue can be seen in the FA (middle middle), and the CNV and retinal oedema have decreased (bottom middle). At 24 months after the treatment, a grey-coloured area in the former location of the CNV can be seen, and a well-demarcated CRA (3.62 disc ratio) has developed surrounding the CNV (top right). The visual acuity decreased to 0.1. Late-phase FA shows no dye leakage within the CRA (middle right), and the CNV is flat (bottom right). Right eye of Japanese woman treated with intravitreal bevacizumab. The refractive error was −8.5 D. One month after the onset, the patient received IVB. A 0.2-disc-diameter juxtafoveal myopic choroidal neovascularisation (CNV) can be seen with subretinal haemorrhage. The best-corrected visual acuity (BCVA) was 0.4, and there was no chorioretinal atrophy (CRA) around the CNV (top left). 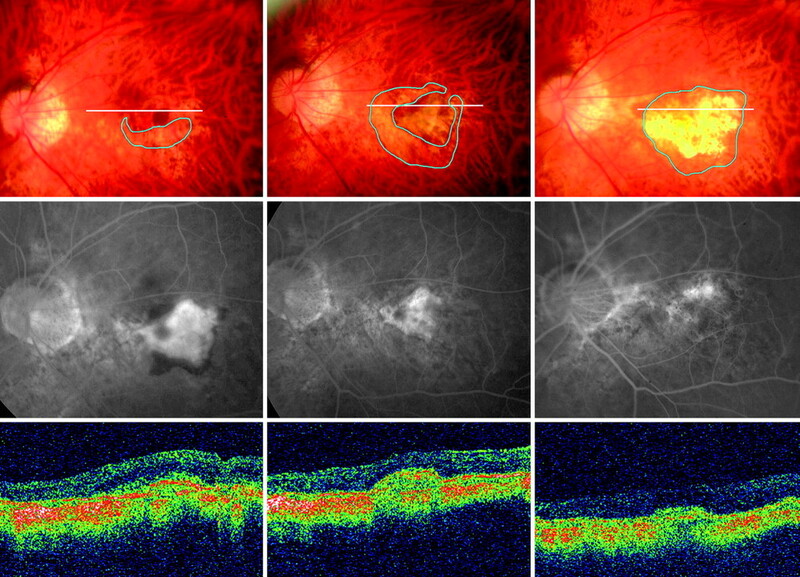 Fluorescein angiography (FA) shows dye leakage in the late phase (middle left), and optical coherence tomography (white line indicated in colour fundus image) demonstrated highly reflective CNV with retinal oedema (bottom left). At 12 months after the treatment, the subretinal haemorrhage has disappeared, and the CNV is more pigmented. The BCVA has improved to 0.6, and a 0.12 disc ratio CRA developed (blue line, top middle). A weaker hyperfluorescence can be seen without dye leakage (middle middle), and the CNV and retinal oedema has decreased (bottom middle). At 24 months after the treatment, CRA developed to 0.65 disc ratio around the CNV, and subretinal haemorrhage due to recurrence at 21 months was observed at nasal superior to the original lesion (top right). A second attempt of intravitreal bevacizumab was made against the recurrence at this eye. The visual acuity remained at 0.6. 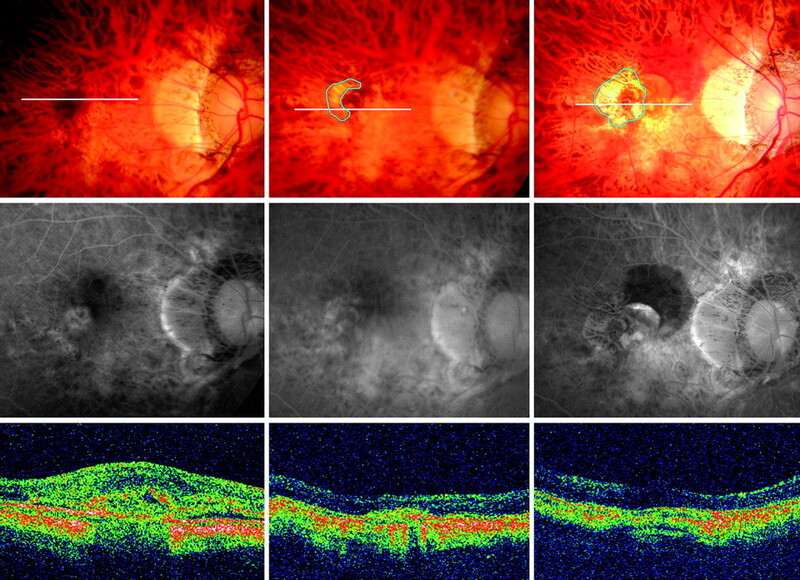 The late-phase FA shows new lesion of dye leakage, which was not seen at 1 year (middle right); however, the original CNV is flat, and no prominent retinal oedema can be seen (bottom right). The mean BCVA at 12 months was 0.80±0.28 logMAR units in Group A and 0.49±0.42 logMAR units in Group B (figure 3A). The change in the BCVA from the baseline BCVA was significant in Group B (p=0.003) but was not in Group A (p>0.05). The BCVA in Group B was significantly better than that of Group A at 12 months post-treatment (p=0.031). Also, nine eyes (75%) in Group B gained more than one line from baseline, but only three eyes (25%) in Group A gained the same degree of visual improvement. Effect of photodynamic therapy (PDT) and intravitreal bevacizumab (IVB) on different retinal factors. (A) Best-corrected visual acuity after photodynamic therapy and intravitreal bevacizumab. (B) Central foveal thickness after the two treatments. (C) Choroidal neovascularisation (CNV) thickness after the two treatments. (D) Chorioretinal atrophy (CRA) size after the two treatments. p Values adjacent to the lines show the significance of change from the baseline. The lower p values demonstrate the significance of differences between two groups. At 12 months, the CFT (figure 3B) and CNV thickness (figure 3C) was 203±49 and 311±82 μm in Group A, and 185±35 and 297±102 μm in Group B. The decrease in the CFT and CNV thicknesses was significant in both groups (p=0.005, 0.003 in Group A and p=0.002, <0.001 in Group B). The difference in the CFT and CNV thickness between the two groups was not significant (p>0.05, >0.05 respectively). The average area of the CRA was 1.55±0.99 DR in Group A and 0.83±0.42 DR in Group B at 12 months (p<0.01, <0.001, figure 3D). The CRA area in Group B was significantly smaller than that in Group A at 12 months (p<0.05). Twenty-four months after the treatment, the BCVA was 0.78±0.24 logMAR units in Group A and 0.50±0.38 logMAR units in Group B (figure 3A). The changes from the baseline BCVA were significant in Group B (p<0.01) but not in Group A (p>0.05). The mean BCVA was significantly better in Group B at 24 months (p=0.041). Eight eyes (66.7%) in Group B gained more than one line from baseline, but only five eyes (41.7%) in Group A gained the same value at 24 months. The CFT and CNV thickness at 24 months was 192±41 and 290±63 μm in Group A, and 174±36 and 276±106 μm in Group B (figure 3B,C). The decrease in CFT and CNV thickness was significant in both groups (p=0.003, <0.001 in Group A and, p<0.001, <0.05 in Group B). The differences in the CFT and the CNV thickness between the two groups were not significant (p>0.05, 0.05, respectively). At 24 months, the CRA areas increased to 2.04±1.38 DR in Group A and to 1.04±0.54 DR in Group B (p<0.01, p<0.001). The CRA area around the CNV was significantly larger in Group A than in Group B at 24 months (p<0.05). The coefficients of correlation between the visual acuity and CFT at 12 and 24 months in both groups were not significant (Group A: p=0.171, p=0.106; and Group B, p=0.851, p=0.799). On the other hand, there was strong correlation between the visual acuity and CRA area at 12 months in Group B (p=0.018, r=0.72);it was moderate in Group A at 12 and 24 months (p=0.035, 0.049; r=0.64, 0.62) and in Group B at 24 months (p=0.023, r=0.69). No ocular or systemic complications including cardiovascular complications were detected in both groups up to 24 months after the initial treatments. Currently, the most common treatment of mCNVs is PDT. However, a PDT study (VIP study) revealed no significant improvement of the primary outcome at 24 months.9 The visual changes in the VIP study at 24 months showed that 12% of the eyes had a >3 line increase, 39% had >1 line increase, 35% had <1 line decrease, and 10% had <3 line decrease.10 Although the number of re-treatments with PDT in an earlier study was greater than ours, the distribution of the visual acuity changes was quite comparable with our results in the PDT group (8, 25, 42 and 17% respectively). IVB was introduced as a new treatment of neovascularisation-related eye disease including mCNV.12–17 The improvement of vision after IVB has been reported up to 12 months (table 212–17). There has been only one comparative study after a 1-year follow-up of PDT and IVB, and these authors reported that 42% of the cases had a >3 line improvement, and 49% had a >2 line improvement in the BCVA, which was better than that after PDT.17 At 12 and 24 months, our results with a similar or smaller number of eyes showed an increase in vision of >3 lines in 42% and 2 lines or more in 58% of the eyes. Although we carefully determined the indications for reinjection, the dose and numbers of injection might have affected the differences between our results and those of others. Our re-treatment interval was longer than that of most recent studies because the safety of IVB had not been reported when we began usng IVB. However, even under this treatment regime, the cases after IVB had a better visual acuity and smaller CRA formation in spite of the relatively lower overall dose of IVB. More intensive use of IVB might have resulted in better morphological and functional prognosis. It must still be determined whether more intense treatments with IVB will result in better vision in mCNV patients. We found a significant decrease in the CFT and CNV thicknesses in both groups at 12 and 24 months. The CFT in our IVB patients were relatively thinner than previous reports (185 vs 206–214 μm at 12 months),13 14 but they were still thicker than that of normal eyes. The longer follow-up period might show a further thinning of the CFT possibly causing a long-term visual impairment. Eyes in both groups showed a certain degree of expansion of the CRA at 12 and 24 months. The areas were greater at 24 months, and the CRA had most likely progressed. The influence of PDT and IVB on the CRA formation has not been determined. The choriocapillaris can be occluded after PDT,21 and may result in RPE dysfunction and contribute to the CRA formation. Bevacizumab is a humanised murine monoclonal antibody against vascular endothelial growth factor (VEGF), and VEGF is known to maintain the normal function of endothelial cells.22 Bevacizumab occludes vasculature after binding to the receptor of endothelial cells of the CNV. No adverse effect has been reported electrophysiologically,23 but bevacizumab has the potential to damage the choriocapillaris, for example, loss of fenestrations,24 resulting in RPE disabilities, although our and previous17 results suggest that bevacizumab is less damaging to the normal RPE–choriocapillary complex compared with PDT. The CRA area was significantly smaller in the IVB treated eyes, which may be partially explained by the fact that VEGF stimulates RPE cell migration. Bevacizumab decreases the RPE cell migration and might prevent CRA formation to some extent. Because there was a significant correlation between better BCVA and smaller CRA area at 24 months, the use of IVB might slow the growth of CRA and visual decrease than PDT. In addition, although we did not include cases which received PDT before, the favourable visual outcome has encouraged us to use IVB to treat patients after an earlier PDT. One of the limitations of this study was its retrospective and non-randomised design. To increase the reliability of this study, we matched the age and initial BCVA in both groups because the BCVA at 5 years after onset has been reported to be mainly affected by the patient's age and initial BCVA.25 In addition, because we treated mCNV patients consecutively, at the same institution, and used one inclusion and re-treatment criteria for both treatments, we were able to compare the two treatments fairly. In conclusion, we studied the long-term results of PDT and IVB for mCNV. The BCVA was better after IVB for up to 24 months. The expansion of a CRA around the CNV was less in the IVB treated eyes. Although IVB showed a better resolution of CNV with smaller CRA formation, considering the possible systemic complications and adverse ophthalmic effect, IVB is still not the ultimate treatment of mCNV.
. The nature of pathologic myopia. In: Curtin BJ, ed. The myopias. Basic science and clinical management. Philadelphia, PA: Harper & Row, 1985:237–45.
. Myopic choroidal neovascularization: a 10-year follow-up. Ophthalmology 2003;110:1297–305.
. Long-term visual outcome of choroidal neovascularization in pathologic myopia: natural history and laser treatment. Eur J Ophthalmol 1997;7:307–16.
. Laser photocoagulation of choroidal neovascularization in pathologic myopia: long-term results. Int Ophthalmol 1994;18:339–44.
. Photocoagulation scar expansion after laser therapy for choroidal neovascularization in degenerative myopia. Retina 1990;10:239–43.
. Photodynamic therapy vs limited macular translocation in the management of subfoveal choroidal neovascularization in pathologic myopia: a two-year study. Am J Ophthalmol 2007;143:68–76.
. Surgical treatment of subfoveal neovascularization in myopia: macular translocation vs surgical removal. Am J Ophthalmol 2002;133:530–6.
. Combined photodynamic therapy and intravitreal triamcinolone acetonide for the treatment of myopic subfoveal choroidal neovascularization. Am J Ophthalmol 2006;142:335–7. Verteporfin in photodynamic therapy study group. Photodynamic therapy of subfoveal choroidal neovascularization in pathologic myopia with verteporfin 1-year results of a randomized clinical trial-VIP report No.1. Ophthalmology 2001;108:841–52. Verteporfin in photodynamic therapy study group. Verteporfin therapy of subfoveal choroidal neovascularization in pathologic myopia. 2-year results of randomized clinical trial-VIP report No.3. Ophthalmology 2003;110:667–73.
. Choroidal vein and artery occlusion following photodynamic therapy in eyes with pathologic myopia. Graefe's Arch Exp Ophthalmol 2006;244:1363–6.
. Intravitreal bevacizumab treatment for choroidal neovascularization in pathologic myopia: 12-months results. Am J Ophthalmol 2009;147:87–93.
. Intravitreal injection of bevacizumab for myopic choroidal neovascularization: 1-year follow-up. Eye 2009;23:2042–5.
. Intravitreal bevacizumab (Avastin) for myopic choroidal neovascularisation: 1-year results of a prospective pilot study. Br J Ophthalmol 2009;93:150–4.
. Intravitreal bevacizumab to treat subfoveal choroidal neovascularization in highly myopic eyes: 1-year outcome. Br J Ophthalmol 2009;93:448–51.
. 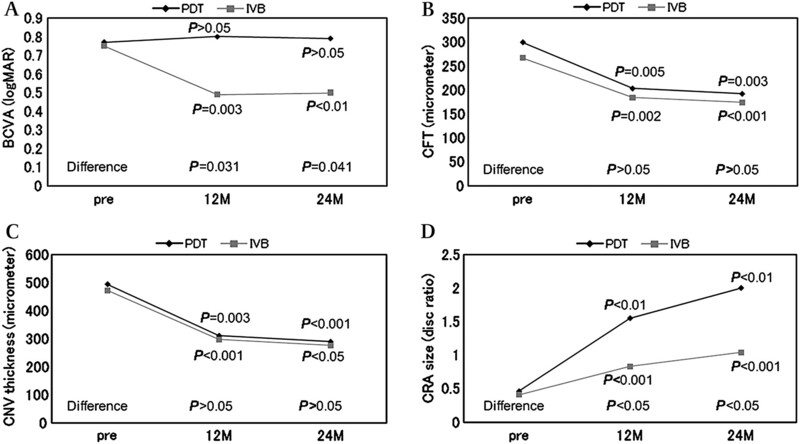 Comparison of visual outcome and regression pattern of myopic choroidal neovascularization after intravitreal bevacizumab or after photodynamic therapy. Am J Ophthalmol 2009;148:396–408.
. Photodynamic therapy with verteporphin for choroidal neovascularization of pathogenic myopia in Japanese patients: comparison with nontreated controls. Am J Ophthalmol 2008;145:518–26.
. Retinal pigment epithelium changes after photodynamic therapy for choroidal neovascularization in pathological myopia. Acta Ophthalmol Scand 2007;85:50–4.
. Types of fundus changes in the posterior pole. In: Tokoro T, ed. Atlas of posterior fundus changes in pathological myopia. Tokyo, Japan: Springer, 1998:5–22.
. Clinicopathologic study after submacular removal of choroidal neovascular membranes treated with verteporfin ocular photodynamic therapy. Am J Ophthalmol 2003;135:343–50.
. The biology of VEGF and its receptors. Nat Med 2003;9:669–76.
. Electrophysiologic findings after intravitreal bevacizumab (Avastin) treatment. Retina 2006;26:270–4.
. Ultrastructural findings in the primate eye after intravitreal injection of bevacizumab. Am J Ophthalmol 2007;143:995–1002.
. Estimation of visual outcome without treatment in patients with subfoveal choroidal neovascularization in pathologic myopia. Graefe's Arch Clin Exp Ophthalmol 2006;244:1474–9. Ethics approval Ethics approval was provided by the Chiba University Graduate School of Medicine, Chiba, Japan.